Early this year, controversial socialite Risper Faith claimed that she had seen the ‘light.’ The b()()tylicious and curvaceous socialite gave her life to Jesus Christ and that was so shocking. It was unbelievable. How? When? Where? Are just some of the questions that disturbed many people. Personally, I beg to defer with her. I am not hating. I am poor at that. I am not judging too since that is God’s work, just as Tupac Shakur stipulated, only God can judge me. But some things are rather obvious. You don’t need to know rocket science to differentiate a fake Christian from a real one. Going to church doesn’t mean you are saved neither does saying that you saved mean you are saved. Actions speak louder than words. 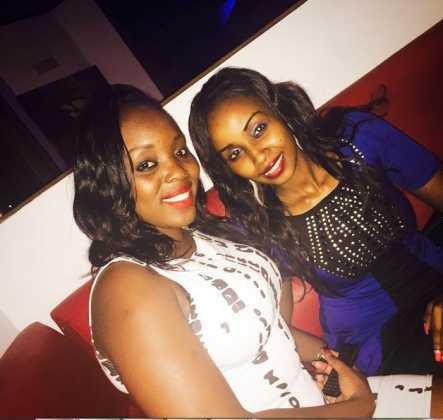 Recently, Risper faith has been attending secular functions and events. Most of the posters with her pictures are secular. Please spare me the crap (cliché) that Jesus Christ came for the sinners hence the word of God should be spread in clubs and pubs. That’s just an excuse that most of this ‘gospel’ artistes have been using to save their names and careers. Many of them drink like fish and smoke like chimney. If you can’t cope with Christianity then forget it. Khaligraph, DNG and DNA too were gospel musicians but they had to quit it. It wasn’t from the heart. ‘Ministers of the word’ should declare their stand. You are either white or black…….No chocolate, hot or cold…no Luke warm. Here is a photo of Risper Faith in a…….not a ‘religious’ place.